Forging an elite addiction to a sport that's changing my life. Have you ever been told that you can’t do your absolute favorite thing anymore? You broke your leg, and can’t play soccer until it’s healed. You’re knee deep in repaying your student loans and can’t afford to travel until they’re almost gone. Well, my absolute favorite thing to do is eat. And this summer I’ve essentially figured out that I can’t really do that anymore. I have a lot of gut health issues. A lot. We won’t go into details (you’re welcome), but essentially my recent life has been consumed with combating and trying to prevent symptoms from crippling almost every move I make during the day. Before 2012, my belly was filled with every yummy treat you could think of. Eating was (and still is) my favorite past time! But after realizing that daily stomach aches weren’t the regular happenings of healthy 20-year olds, I decided to cut out gluten and dairy. Immediately, I noticed a dramatic difference in the way I felt, but still often experienced the same symptoms. In 2014 I said, “Heck, Paleo sounds neat!”, and gave that bad boy a try with a little encouragement from the Crossfit community. Boy did that change everything. I was living a happy gluten-free, dairy-free, Paleo lifestyle with a Zone diet twist (strictly because I don’t know how to portion control… Don’t look at me like that, neither do you!) and I was feeling goooooood. I had more energy, saw results at the gym and in my running, and even dropped a pant size. Problems were solved! 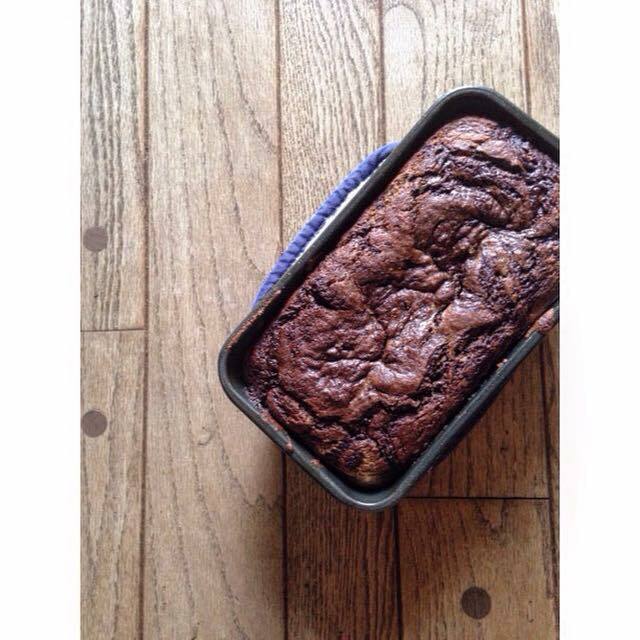 One of my favorite Paleo recipes: Chocolate Cinnamon Swirl Banana Bread from PaleOMG! Here comes June 13, the night I thought I had food poisoning after going to dinner with my parents. It turns out the food poisoning symptoms (intense abdominal pain, nausea) were actually symptoms of a rupturing ovarian cyst. After moving back home for the summer and coming under an immense amount of stress, that bad boy decided it couldn’t take it anymore and exploded inside of me, leaving excess fluid in my abdomen (gross, right?). Luckily for me, I didn’t end up in the emergency room. Unfortunately for me, I’ve been battling significant gut health issues since the day after it happened. Again, I’ll spare you the details, but imagine your digestive system being the only thing you think about pretty much every hour of the day. I became obsessed with learning about why my body was revolting against me after thinking I had finally gotten a handle on my digestive issues. So, I stuck my nose in a book- two, actually. The first, Brain Maker, written by Neurologist Dr. David Perlmutter, first opened my eyes to something called Leaky Gut. Basically, after 20 years of eating gluten (while unknowingly gluten-sensitive), my gut started to break down; more specifically, the flora of my digestive tract, allowing bad bacteria to grow where good bacteria should be, and weakening the ability for my body to decide between good and bad nutrients to be transferred into my bloodstream. (PSA: I am not a doctor, and this is probably the most simplistic version of Leaky Gut available anywhere on the Internet). So, when my cyst ruptured from stress, it irritated my digestive system (a common side effect) and bada bing: chaos ensued. Gut health is a mysterious thing- I know I didn’t understand it until I started reading, and still have so many questions. After multiple procedures (a CT scan and Bacterial Overgrowth Test) and no diagnoses, both doctors I’ve seen have suggested trying a Low-FODMAP diet to minimize my symptoms. Add it to my list of descriptors: gluten-free, dairy-free, nut-free, Paleo, Zone, Low-FODMAP…. What’s next? Is this Low-FODMAP lifestyle going to help? Who knows. After 626 words, you now have a somewhat extensive description of the past two months (and previous three years) of my life. When you struggle to maintain a healthy gut, you struggle to maintain a lot of other things- energy level, anxiety, (sanity), a desire to workout… And man, oh man, have I had to push myself to keep going. When you don’t feel good, all you want to do is lie down until it goes away. Well, when you don’t feel good every, single day… you can understand where this is going. I just completed my third 10k yesterday (sorry social media world for exploding with pictures), and I finished about 5 minutes later than I had set my goal. The first three miles were agonizing because I just couldn’t keep the pace I wanted. But, after realizing I just wasn’t going to meet that goal, my race improved dramatically. Yes, it was hard (hot damn it was hard), but this body has been putting me to the test the past two months and was still able to finish 6.2 miles under an hour. And this body is going to run 13.1 in October (yup, that’s a half marathon. LOL.). Holy crap it’ll hurt, but holy crap am I thankful for the things that I still can do, and you better believe I’ll keep doing them. My struggles do not even compare to others who battle severe, even life-threatening digestive health issues, and I know that, and I’m so thankful for that. But even so, my struggles are my own, and I am proud of the way I’m continuing to try and overcome them. To celebrate these victories, both big and small, I’d like someone to find me a gluten-free, dairy-free, nut-free, Paleo, low-FODMAP piece of chocolate cake with a gigantic scoop of ice cream. Please. Thank you, you wonderful soul!